In order to give the opportunity to our vendors to positively promote themselves to our attendees at the International Convention and the Annual Antler Competition we provided sponsorship opportunities. These range from the registration bags, breaks, awards, and meals. 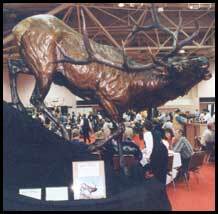 Official Sponsorships to the organization are also available - wouldn't it be exciting to be able to participate in all of the associations events, advertising in every issue of the award winning magazine, and the title of "The Official ITEM of the North American Elk Breeders Association".